We will be using the principles of using seasonal tonic herbs for maintaining our health and wellbeing. We will use freshly foraged elderflowers, nettle, cleavers and marigold flowers and make various different preparations from them. 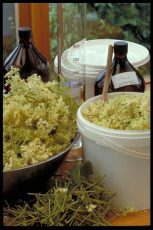 This will include making a tisane, an infused oil, an ointment, a cream, which you will take home with you, together with an increased confidence in, and understanding of, herbs and our relationship with them. Wheelchair accessible front door ramp, and accessible toilet. All on one floor.